Today was a big day! We had our sonogram this morning and it went soooo well! The baby measured wonderfully with all the little organs present and working! The sono technician thinks I am a week farther along than my OB but the due date will probably stay the same. It was an amazing experience. I have to admit that the tears rolled the entire appointment but they were definitely happy tears! So, the technician is 80% sure that we are having a girl! 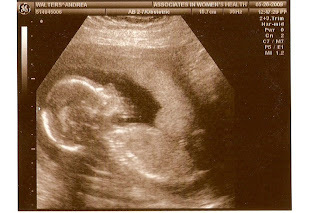 Jeff had a "gut instinct" that we were having a girl so that news was no surprise to him. Of course, I had no idea so I was super excited and surprised. Hello PINK! Yay for Baby Girl Walters! How exciting!! Glad all is well with her development too. Congrats, congrats, congrats!! She will be adorable in the adorable bows you'll make for her!